Is the Congo Facing Another Civil War? In the world’s second-largest Francophone city, the president is reluctant to end his fifteen-year rule. President Joseph Kabila of the Democratic Republic of the Congo, formerly known as Zaire, announced last month that elections scheduled for this year would be delayed until April 2018. As part of the deal struck with the opposition, Kabila’s prime minister, Matata Ponyo, has resigned to make room for an interim government that can guide the transition. 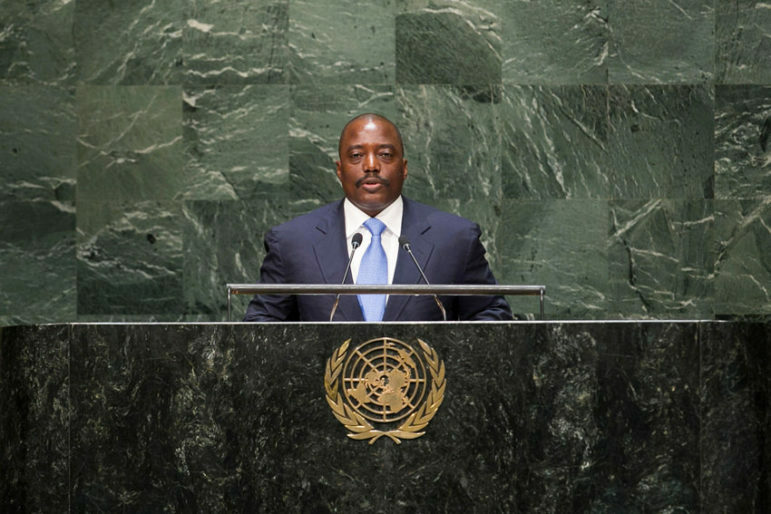 Kabila has claimed that the country does not have the security or financial stability to hold elections before his term is up in December. Opponents fear that the delay is part of a power grab, since Kabila has reached his two-term limit and would be obliged to step down. The current Congolese constitution was ratified in 2006, the sixth constitution to be ratified since the country became independent from Belgium in 1960, and Kabila has already amended it: After winning in a runoff election in 2006, he pushed for a 2011 amendment forbidding second-round elections. This meant that when he stood against 10 other candidates in 2011, he did not need to win a majority—and he won with 49 percent of the vote, which was strongly contested by his opponents. Kabila has actually been in power since 2001; he took over after his father, President Laurent-Désiré Kabila, was shot and killed. There has never been a peaceful transition of power in the Congo. The first president, Joseph Kasavubu, supported Col. Mobutu Sese Seko’s first coup against nationalist Prime Minister Patrice Lumumba, then was overthrown himself in Mobutu’s second coup in 1965. Mobutu ruled for 32 years and saw the country’s economy and infrastructure crumble. He was overthrown in 1997 by Laurent Kabila, whose militias famously employed child soldiers in the Congo’s civil war. Kabila was shot by one of these child soldiers, or “kadogos,” in 2001, and his son Joseph was sworn in. The civil wars in the Congo have embroiled the nations around its borders, aggravating the conflict and prompting the UN to maintain a peacekeeping force. The conflicts are exacerbated by many causes. For instance, in 1994, after President Paul Kagame of Rwanda helped end the genocide that overwhelmed his country, the leaders of Hutu militias that oversaw the genocide fled across the border into the Congo, where they began to attack the Tutsi population. One of the more resource-rich provinces, Katanga, has launched repeated attempts to secede. Both Rwanda and Uganda have been accused of meddling in Congolese politics by backing militias or supplying weaponry. More than five million people have died since 1993. The most recent war ended in 2003, but the fighting is not over, and many fear that Kabila’s attempt to stay in power could be the final push back into full-fledged conflict. The protection of civilians, humanitarian personnel and human rights defenders under imminent threat of physical violence and to support the Government of the DRC in its stabilization and peace consolidation efforts. The mission was repeatedly extended and expanded. In 2013, the Force Intervention Brigade was formed to neutralize armed militias. In 2015, language about protecting elections was added. Today, there are nearly 20,000 UN troops on the ground, at a yearly cost of $1.3 billion. But some question whether the UN is doing enough in the region. In 2010, they failed to aid the 500 women who were raped in Luvungi and the rest of Kivu province, provoking an international outcry. In 2014, they again failed to protect civilians, 30 of whom died in Kivu. Their own attack on Pinga in 2015, which targeted the Hutu militia FLDR, accidentally killed five civilians. Fifty people have already been killed this year while protesting Kabila’s postponement of elections. The fear that further evidence of corruption will spark more conflict is not unfounded, and many fear that it will be beyond the UN’s capacity to help.